I'm mad at myself today. I procrastinated and wound up losing in the end. My camera has been showing low battery for several days. But since I'm not taking tons of pictures and I'm not doing videos right now, I've kept putting off charging it. And now I'm sorry I did. As I was opening the living room curtains a bit this morning so kitty could sit in the window, I was excited to look down and see some tulips about ready to open. But then I looked up and saw something even more exciting. 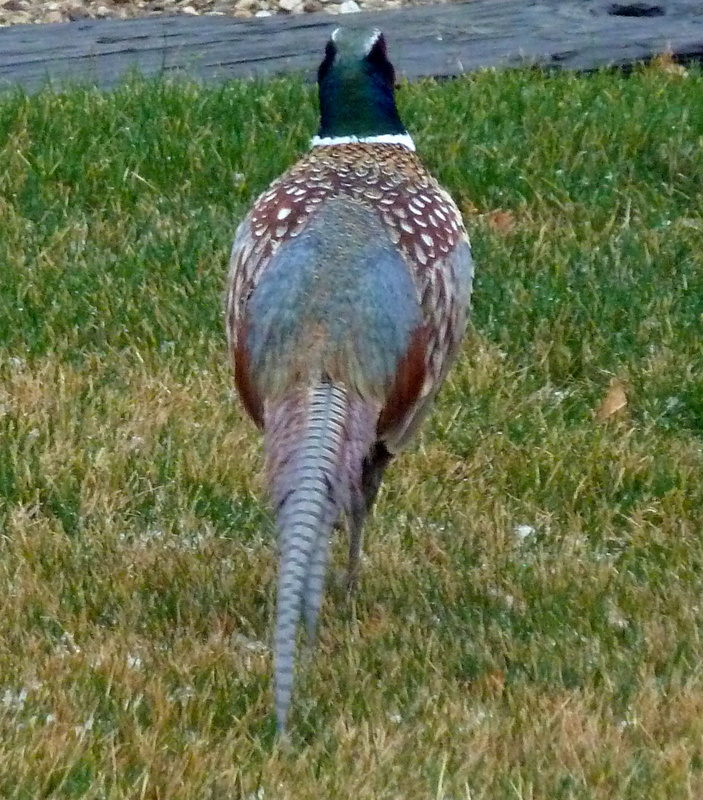 A beautiful, brightly colored boy pheasant walking right across our lawn, just a few feet in front of me. I ran (I don't run, so it was more of a super fast walk) to grab the camera. I turned it on as I left the den so it would be ready by the time I got back to the front window. But the camera beeped at me. And beeped again, and beeped again. As I tried to take a series of pictures of the pheasant (so I could get the best picture) it only snapped one before it shut off. I tried to turn it back on with no luck. Completely dead battery. So today's picture is the only picture left in the battery charge. 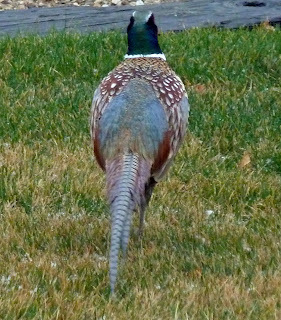 Not the best picture of Mr. Pheasant, but at least I got something.